Korean movies have a tendency of going a completely different way when it comes to renaming itself for the international market. I say different, in the sense that the name is not a complete translation of the original title. Hence, for the past however many years, we have had the monster hit, ‘Monster’ (in Korean) renamed as ‘The Host’ (which, in my opinion, took out a bit of the sass in the original name). There are usually deliberate and, for the most part, works well enough. After all, the original name might be one in which the meaning would be lost under a different context. A name, any name, exists only in a particular context, in order for it to be grounded with more meaning. Hence, the original title for ‘Shadows in the Palace’ is actually 궁녀 (Goong nyaw), which basically means ‘maid’ (or ‘court maid’ in this context). While that accurately describes what the film is about, the international title gets a lot closer to the undercurrents that lies within the story described. While some might classify this under the horror genre (from the marketing and advertising, I notice that it leans closer to movies of that ilk), having watched the film, if such definitions are required, I am more inclined towards describing the film as a period thriller. And quite a thriller it is, too. 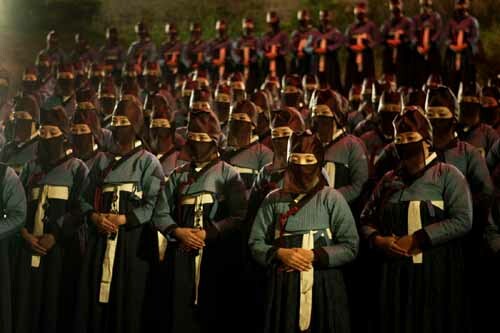 Set during the Chosun dynasty period, a court lady, Wol-ryung (Seo Yeong-hie) is found dead. Though initial impressions led many to believe that she committed suicide, the court medic, Chun-ryung (Park Jin-hie) is not entirely convinced. Being pressured by her superiors to report the incident as a suicide regardless, she then sets out to find the truth, but finds that the path to the truth is not as straightforward as it seems. The deeper she digs, the more intriguing the conspiracy becomes, as it becomes clear that the higher ups are also involved. That’s not to say that they aren’t without their problems either. The King’s concubine, Hee-bin (Yun Se-ah) has just given birth to a young boy, one who, in time, will become the Crown Prince of the court. However, this ascendancy is one that is not viewed kindly by the Queen Mother. The intricate plot continues in this fashion, as issues of identity, loyalty and betrayal comes to the forefront evermore. The main approach that I wanted to take with this film is that of the feminist approach. Not that I decided upon this before the film; rather, with the cast being made up almost entirely of females, and touching upon issues of power and control, what we have here is a movie that might as well be called ‘Girl Power’. 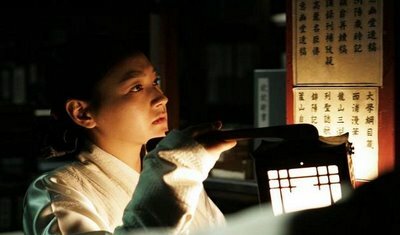 The director, Kim Mee-jeung, is also a female, and the setting of this film is less surprising once you consider that she worked on ‘The King and The Clown’ (which was also set in the same period). Interestingly, the set remains erect to this day, partly as a tourist attraction, and partly as set locations for TV drama and feature films. Coming back to the feminist approach, we see what the power structure is like within the palace. Intrigue runs all the way down, from the very top with the Queen Mother, to the mute maid who clean the floors before them. We see how this affects their relationships with one another, and even more compellingly, how tight the structure grips on their every behaviour. Witness, for example, the scenes where the other maids discriminate against the mute maid, Ok-jin. Witness also the fallacy that is the interrogation that takes when the others frame her for an act she didn’t commit. Men, on the other hand, appears in roles that might have traditionally been the domain of women on the big screen. It is almost half an hour, by my estimation, before you actually see a man on-screen (no, the baby doesn’t count). Even more interestingly, their role is largely limited to a sexual one. A review I read of this film describes them as nothing more than “attractive predators,” and it is a phrase that is as apt as it is as wrong. I would argue that for the most part, it is the women here that is far more predatory in nature. ‘Shadows’, despite its title, is a very graphic film. There are some truly painful scenes here makes me wince. In fact, some of them made me turn away from the screen altogether. Perhaps you have a bigger stomach for such things than me, but gruesome is gruesome nonetheless. There are other scenes of gore and horror that I won’t mention, simply because it might spoil the story more than a bit for you. This leads me to the issue of the genre this film falls in. While the marketing may lead some to think of this as a standard horror flick, it actually works much better as a thriller. There are indeed supernatural elements that runs amok (things that go bump in the night), but instead of pulling it back, it pushes the film further into thriller territory. It supports it, rather than hindering it. In a literal sense, the shadows haunts the palace and forces fear out of those it stalks. That is the horror part. However, it is the aftermath of the fear that advances the thriller, as the court medic uncovers more clues due to this. Having said that, it is also a scary film when the shadows do play a part. In fact, within the minutes the horror of this film has to play it, it is scarier than entire ‘horror’ films I can think of. It is the subtlety of the scenes that gives rise to it: the silence in the forest, the blurred visions of something or someone standing right in front of you. Credit, then, to director Kim for balancing this well. Credit, too, shall be given to the film: for the cast, for the complex storyline that, for the most part, engages rather than confuses the audience, for the fine production designs that light up the set in the day with their colours, and for their ability to add sinisterness to the night as well. Though some may want to view ‘Shadows’ as a triumph for women (it is one of the few to have such a heavy female presence, both on and off the screen), but it is a fine film that deserves to stand on its own two feet, regardless of gender. Fikri tries hard not to think of Alec Baldwin every time he writes the word ‘shadow’. what does the cutting of the protagonist’s meant? The protagonist’s palm was cut and was forced to join another’s cut palm..what does it symobolize?